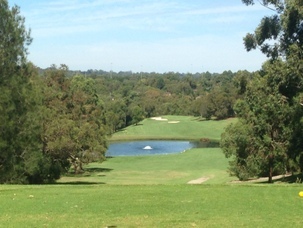 Long par 5 which is trouble from start to finish. Tee shot from an elevated tee is hit to a wide, undulating fairway cut short by a large dam which forces a lay up off the tee for longer hitters. The second shot over the water requires accuracy and distance. The shot into the green is fraught with danger; any shot missing left or long is destined for trouble. A two tiered green adds to the difficulty. Many a good round has been ruined here.